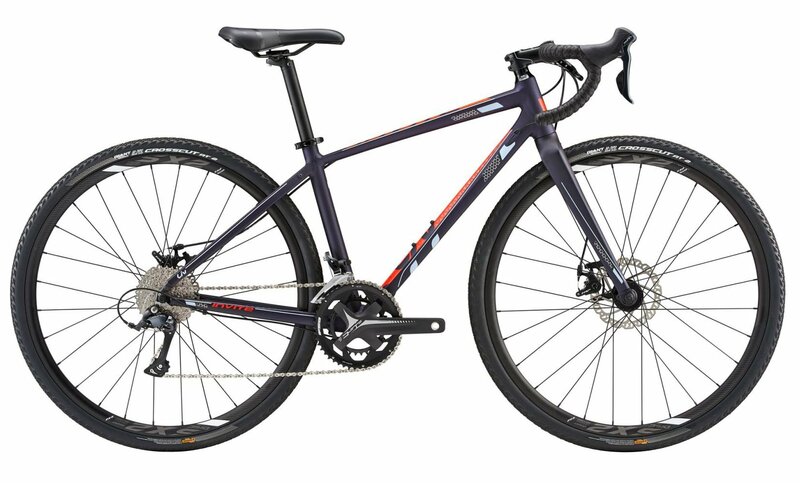 A lightweight ALUXX SLR aluminum frame, smooth-handling composite fork, and drop-bar positioning make the Liv Invite the right choice for adventuring into the unknown. When the pavement ends, your ride doesn’t have to. The fast-rolling 700c wheels are fitted with high-volume Giant tires. These allow you to run lower tire pressure for comfort and traction. Powerful disc brakes with 160mm rotors give you added confidence and control on rough roads and in all types of weather. The Liv Invite is the perfect machine for tackling imperfect roads. The Liv Invite features the top tier ALUXX SLR aluminum frame that is lightweight and durable while providing a comfortable and responsive ride. The Shimano Sora drivetrain provides all the gear range needed to spin your way up the climbs and mash your way down groomed fireroads. The durable Giant wheelset spins fast and smooth on sealed bearings. A composite fork keeps the front end on point and helps to dampen road and trail vibrations. When it comes time to slow things down, Tektro mechanical disc brakes will get the job done with confidence in any condition. 145 - 163 cm 5'1" - 5'6"
156 - 168 cm 5'4" - 5'9"
163 - 175 cm 5'6" - 5'11"